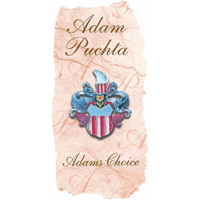 1 Adam Puchta Winery stemless wine glass. 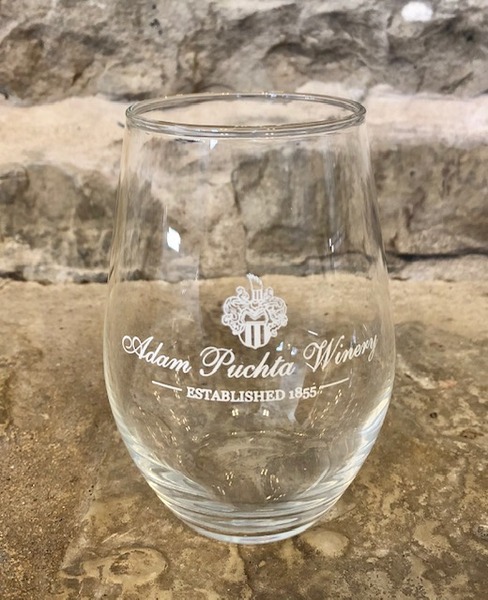 Just perfect for sipping our wines! 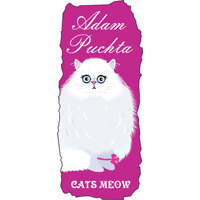 Cats Meow Gift set- This wine gift IS the Cats Meow! 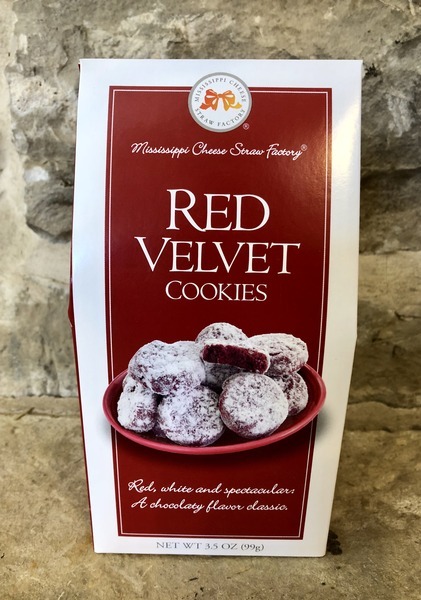 This semi sweet red wine is delicious on it's own but is purrrr...fect when paired with our Red Velvet Cookies, or any chocolate of your choice. 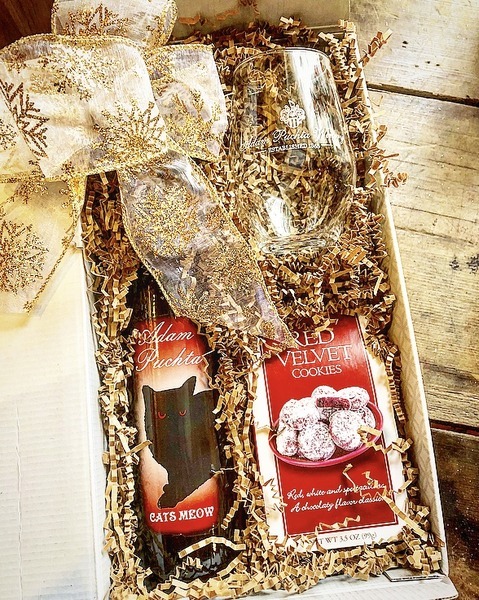 Our signature APW crest stemless wine glass makes this gift set complete. Berries Jubilee Duo- This sweet, dessert style wine duo will delight any berry and sweet wine lover and dance on the palate with jubilation! 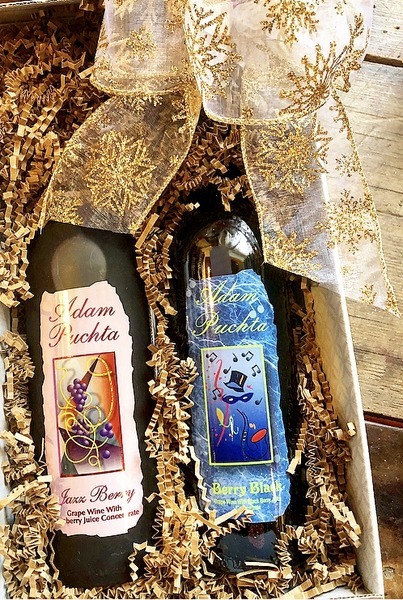 Our Berry Black Wine and Jazz Berry Wines are delightful on their own or pair beautifully with decadent chocolate desserts and make a wonderful wine gift. 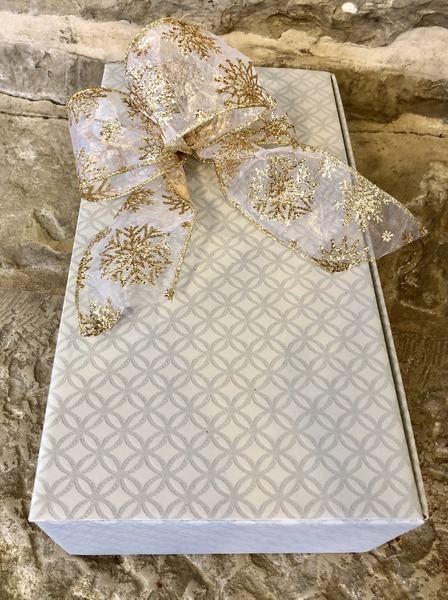 Dry White Duo- Our award winning Dry Vignoles and Vidal Blanc make a perfect dry white wine duo that will delight the palate of any wine connoisseur on your list, but trust us, you may want to keep it for yourself! 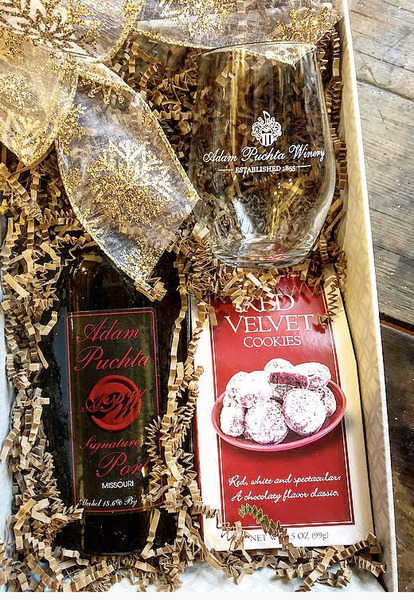 APW's award winning Signature Port pairs beautifully with dark chocolate which is why we've paired it with our Mississippi Cheese Straw Companies decadent Red Velvet Cookies in this gift set that is sure to please the Port connoisseur's palate, and yours as well. 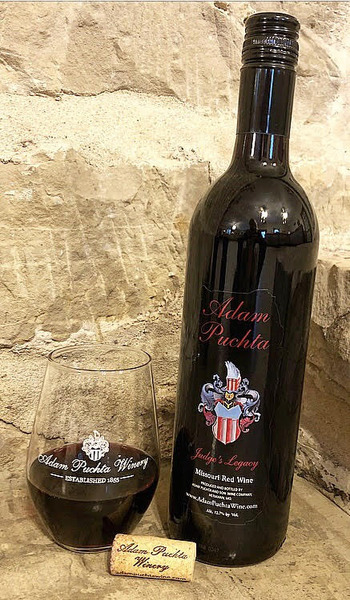 A stemless wine glass decorated with our APW family crest and the Adam Puchta Winery name complete this Port lovers gift set. 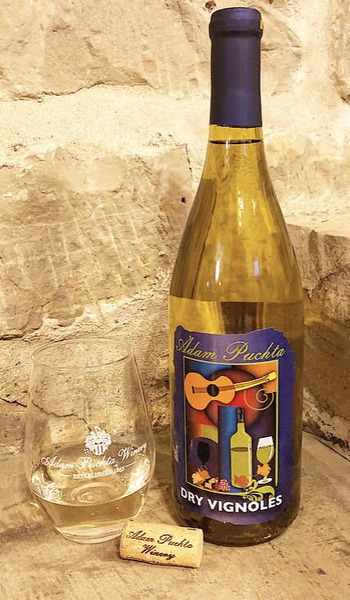 A unique, dry white wine that brings a bit of the tropics to Missouri. 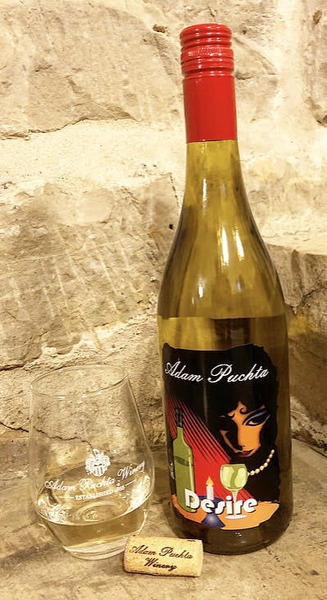 This wine has been fermented with toasted French and American oak for a taste of the islands while exhibiting ripe mango and cherimoya characteristics with a background aroma of vanilla and roasted coconut. Serve slightly chilled with your favorite grilled seafood. The aroma of a spring time garden, a subtle bouquet of pear and citrus comes alive with baked chicken, roasted duck and smoked foods. Superb with shrimp, lobster or scallops. Fresh basil and garlic are two spices that compliment this fine dry white. Serve chilled. Similar to a Pinot Grigio. A light oak complexity and a spicy finish. 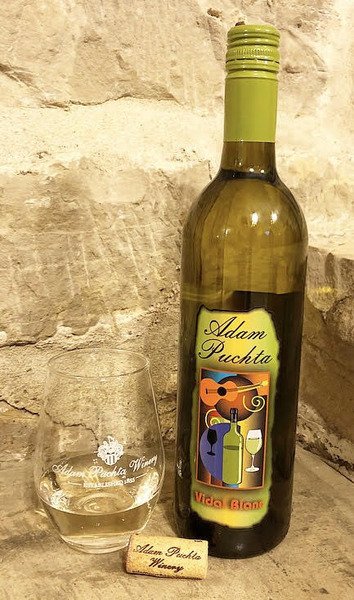 This clean crisp dry white wine exhibits flavors of green apple and pear. Excellent with seafood, baked Brie or mild French cheeses. A true hit at any celebration or quiet dinner for two. Best served chilled. Similar to an oaky-style Chardonnay. Off-dry white wine with fruit-forward essences of peach, strawberry & kiwi, yet finishing with a crisp citrus flare. Enjoyable on its own or with flavorful foods such as Cajun shrimp or Mexican foods. 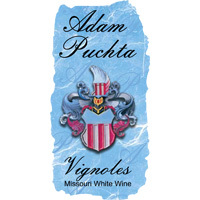 Made from 100% Missouri Vignoles grapes. 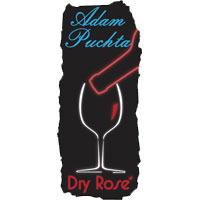 The enticing aroma of this dry full-bodied Rosé evokes the scents of strawberry and pineapple guava. Inspired by the tradition of the Old World Rosés, it makes a great companion to grilled chicken, soft-shell seafood, Mexican or Alfredo sauces. Serve slightly chilled. Similar to a French or Spanish Dry Rosé. Hand-crafted for the adventurous at heart. Best served slightly chilled. A perfect blend of Missouri Norton, Chambourcin and Noriet grapes with a touch of oak and silky tannins. 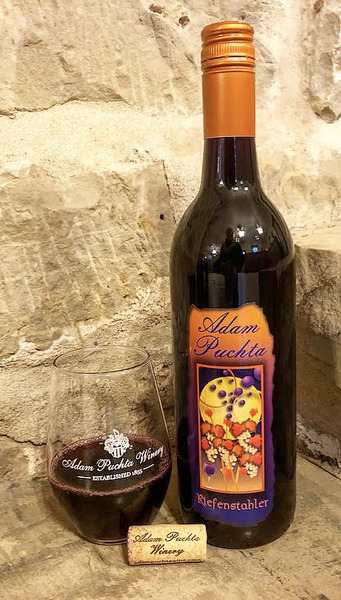 This medium-bodied, dry red wine has a spicy, black licorice and plum bouquet, while the subtle flavor of caramel and dark tart cherry round out the finish. Legacy pairs well with wild game, red meat and light Italian fare. Impetuous and moody, this sultry red wine is rich with earthy tannins that dance on your taste buds like an evocative Spanish dancer. Fruity flavors of pomegranate, dark cherries and cranberries characterize this visually stunning red wine from Chambourcin grapes. Pairs well with Italian, spicy, pork and lamb, but the low acidity makes it great for almost any food “situation”. A complex, full-bodied, dry red wine made from our estate-grown Norton grapes. 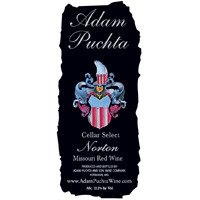 Norton fans will love the bold and rich layers of berries, plums, toast and spice. French and American oak aging intensifies the complexity and provides a smoky, vanilla finish. While flavorful now, it will continue to develop with age. A velvety non-oaked semi-dry red wine with a mild floral nose. 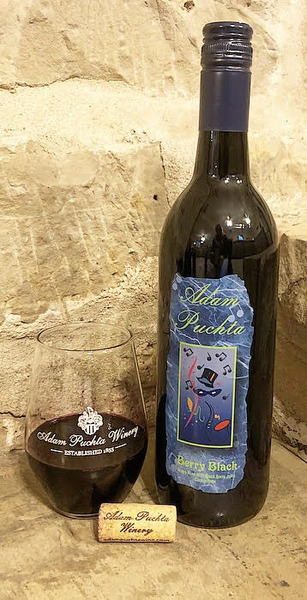 A fun wine to pair with many Italian foods, peppery/spicy BBQ, hearty stews, venison and summer sausage. A choice red wine for cooking. Serve at room temperature or chilled. Similar to a Chianti. A unique blend of Norton vintages selected from our cellars to creates this smooth, full-bodied, dry red wine. 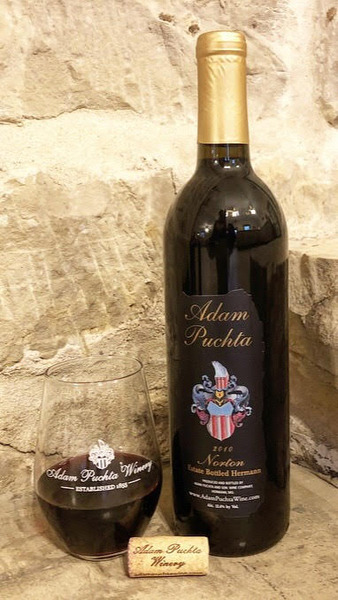 Our Cellar Select Norton has bold blackberry and black cherry aromas and flavors that are balanced by aging in French and American oak. The wine lingers on the palate with subtle notes of cocoa and toasty vanilla. This Norton pairs well with Kansas City-style BBQ, grilled steaks or dark chocolate. 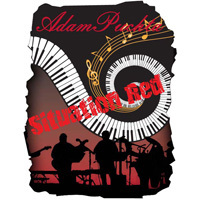 Rich and velvety with sweet, jammy flavors of plum, dark cherry, currant and ambrosia melon. 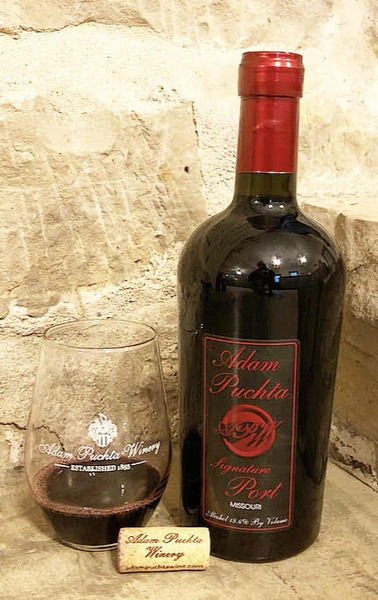 Named in honor of the Winery's most popular residents, our feline friends, this versatile wine is great with anything from spicy foods to chocolate desserts. Perfect chilled on a hot summer day or for sipping in front of the fire to ward away the winter frost. Act on your impulses! Chocolate, date night, star-gazing...This wine pairs perfectly with any irresistible desire. Impulse is a delicate, light-bodied, semi-sweet wine made from 100% Missouri cold-pressed grapes. Cold-pressing the grapes allows for the retention of both the aromas and fruit characters that are amplified when served chilled. The crisp, well-balanced flavors of tart cherries, watermelon and passion fruit come together for a refreshing wine to drink on an impulse. 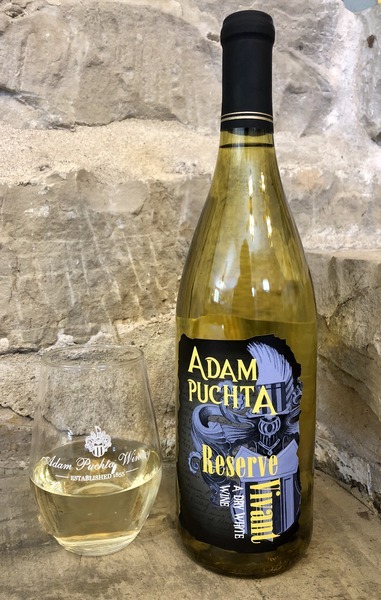 This semi-dry blended white wine is a drier version of our most popular wine, Adam’s Choice; its crisp and refreshing, with hints of kiwi, lime and green apple. A food friendly wine that pairs well with poultry, shellfish or Asian cuisine. 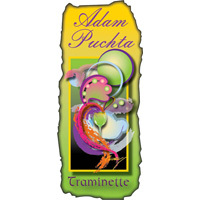 An aromatic fruity and floral wine evocative of jasmine, honeysuckle, rose, peach and kiwi. Great alone as a patio wine, but also perfect with spicy foods and delightful with holiday desserts. 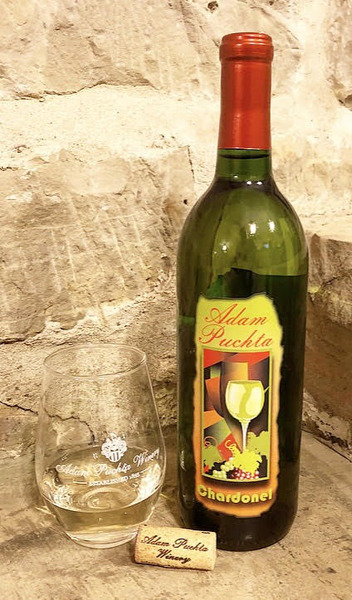 Similar to Gewürztraminer. Serve chilled. Our semi-sweet Germanic style white wine transports one to the banks of the Rhine River. A crisp blended wine for hot summer days. Great for picnics with fruit, cheese and crackers. Similar to a German Riesling. A luscious sweet white wine bursting with peach, strawberry and kiwi with a citrus finish. 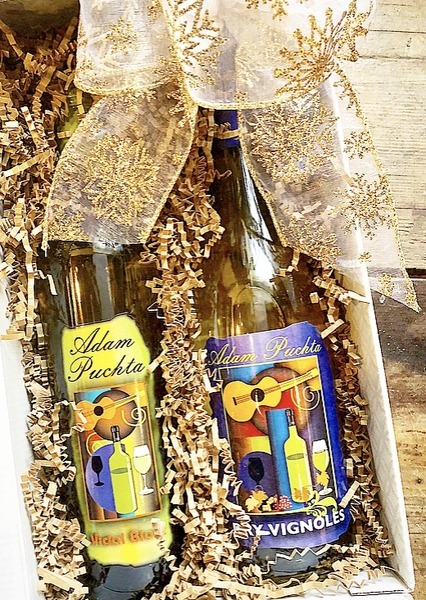 This versatile wine pairs with any spicy cuisine - Mexican, Cajun, Thai or Buffalo. Tasty with lemon chicken or lime shrimp. Sample it with our Key Lime Shortbread Cookies; it tastes just like a margarita! 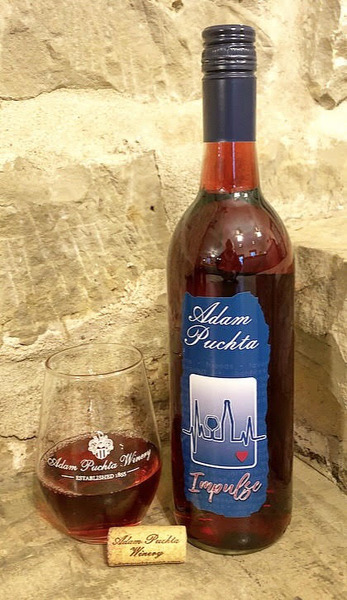 A sweet red dessert wine with a full Concord bouquet and rich blackberry jam characteristics. Great with a peanut butter sandwich, peanut butter cookie or mix it in a spritzer, smoothie or slush. 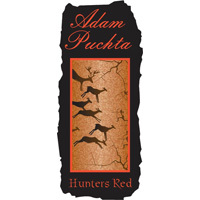 Our number one selling red wine - take one sip and you'll see why! 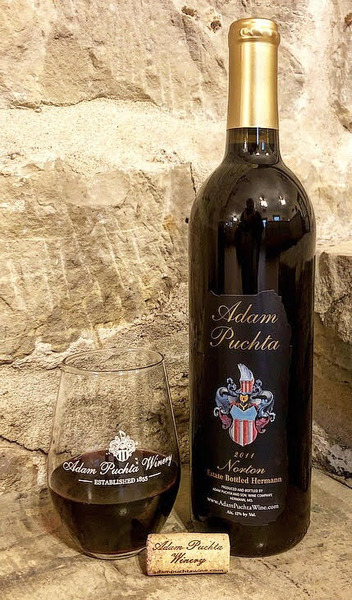 An old-fashioned style wine reminiscent of Missouri’s wine heritage. 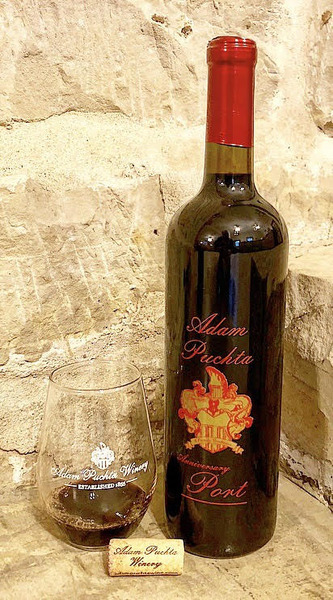 This wine exhibits the natural sweetness of freshly picked blackberries. Mix it with berries for a dessert topping or a sauce for pork loin. A fruity sweet red wine perfect for the chocoholic. An intense raspberry bouquet and the taste of ripe berries. Serve with chocolate desserts, custards or even over ice cream. Exhibits the style of Ruby character ports known for their rich fruity quality. An emphasis on ripeness, depth and smoothness, it pairs well with fine dark chocolate desserts. 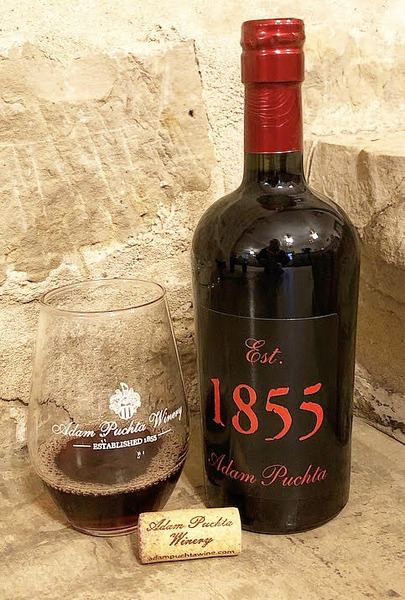 Reminiscent of vintage ports, it has been aged for six years with toasted French and American oak to create caramel and vanilla character on the nose and palate. From a Norton base, fig, plum and black cherry flavors combine with hints of spice and coffee. Serve with blue-veined cheeses, candied nuts and dried fruits. 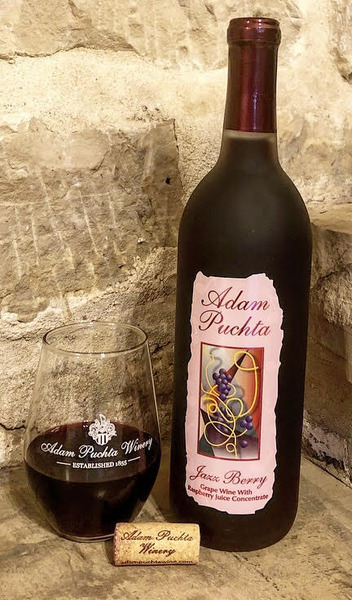 Named for the year Adam Puchta founded the Winery, this unique wine exhibits smooth rich taste. Ten years in the making, it can be a before or after dinner drink. Nutty caramel flavor pairs nicely with Gorgonzola or Gruyere. Serve cold in a small thin glass.